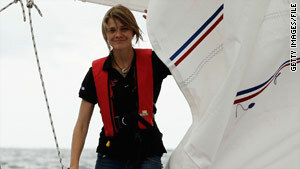 Jessica Watson was due to finish her solo round-the-globe voyage on Saturday, days before her 17th birthday. (CNN) -- Jessica Watson has heard the rumbling over whether she can rightfully claim she's the world's youngest person to have sailed around the globe solo, nonstop and unassisted. She's not impressed with the controversy. 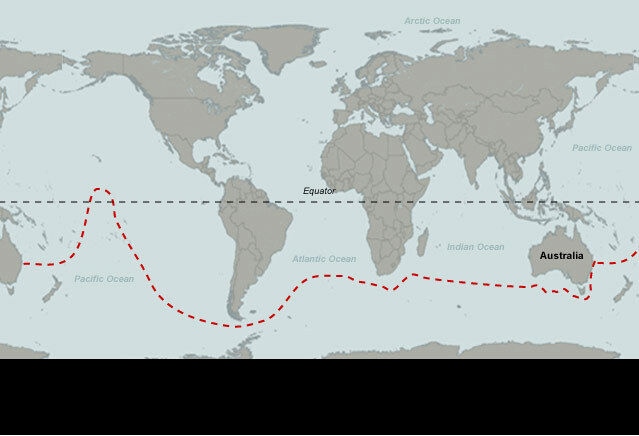 Watson, 16, is scheduled to sail into Sydney, Australia, on Saturday morning before tens of thousands of onlookers, seven months after leaving the same city on a eastward journey that saw her cross the equator, navigate South America's treacherous Cape Horn in 40-knot winds, round South Africa, and survive nasty conditions in the Southern Ocean, where her yacht was knocked over to the point where her mast hit water -- all by herself. But a storm over whether she's bested Jesse Martin, a fellow Australian recognized in 1999 as the youngest to make the voyage at 18, came to a head on sailing news websites last week, centering not on her age, and not on whether she went around the world, but on whether she had sailed far enough. "If I haven't been sailing around the world, then it beats me what I've been doing out here all this time!" Watson wrote in her blog last week in response to the hubbub. So, is she about to supplant Martin? Your answer may depend on how you define a round-the-world sail for comparisons, and whether you think a distance rule set by a record-keeping body matters since the body no longer recognizes "youngest" categories anyway. That's the minimal distance the World Sailing Speed Record Council, which certified in 1999 that Martin was the youngest to make the trip, mandates for round-the-world courses. And to get that distance, Watson would have needed to sail father north while she was above the equator, said Rob Kothe, managing editor of Sail-World.com. Independent navigators' calculations put Watson's orthodromic distance at less than 19,000 nautical miles, according to the website. "This had absolutely nothing to do with Jessica, the poor kid, from our point of view," Kothe, who called her achievement magnificent, said in a telephone interview this week. "We believed that the management decisions that were made were probably not the best ones for her if she was attempting to beat Jess Martin's record." Watson's team, which declined to comment for this story, has countered the criticism two ways on her website. First, the team said Watson isn't aiming for any WSSRC record, because the council has stopped recognizing the "youngest" category. Nevertheless, a May 5 statement on Watson's website lists part of the WSSRC's rules word-for-word -- without noting they're the body's rules -- when discussing what Watson must do, including start from and return to the same point, cross all longitudinal meridians, and cross the equator. It leaves out the WSSRC's rule about 21,600 orthodromic nautical miles. The WSSRC stopped recognizing "human condition" categories such as age or disability, partly because they could expand to the point where everyone could claim a life-status record, said John Reed, WSSRC secretary. Second, the team said Watson already traveled more than 22,800 nautical miles as of May 9. However, it hasn't claimed the distance is orthodromic. Sail-World.com has written that Watson "will no doubt have traveled around 23,000 miles according to her log," but log distances include tacks and gybes, or zig-zags. Sailed distance, including these tacks and gybes, is always greater than orthodromic distance "because a yacht can rarely point directly to its next destination and needs to tack and gybe," said Reed in an e-mail that made no comment on Watson's voyage. The e-mail was part of a response affirming that Martin's 1999 route met the WSSRC's orthodromic standard. After Watson's representative, Andrew Fraser, declined to comment about the controversy, CNN e-mailed him specific questions, including about whether critics' contentions about her orthodromic distance were wrong. He declined to answer the questions. Kothe said for him, the issue was finished because Watson's team stopped claiming Watson will beat Martin's "record." He told The Age newspaper of Melbourne, Australia, that a sentence in the "About Jessica" section of her website -- "Jessica Watson has set her sights on beating Jesse's achievement" -- used to read "... beating Jesse's record." Watson's website notes that Martin himself, as well as British teen Mike Perham, who finished a round-the-world, solo but assisted sail in 2009 at 17, will be in Sydney to congratulate her on Saturday, days before her 17th birthday. "Jessica has definitely sailed around the world and she is only 16. Everyone should be proud of what she has achieved," Perham said in a May 9 statement on the website. Guinness World Records follows the same standards as the WSSRC when considering sailing records, spokeswoman Sara Wilcox said. Kothe, who said Watson's sailing has been admirable -- particularly in light of the knockdowns in the difficult Southern Ocean -- speculated Watson's route was chosen with time and safety in mind. He noted a September accident delayed her trip, and that to make a mild-weather window at Cape Horn, which came after the equator crossing, she needed to get to the cape when she did. "From a parental point of view, the route is pretty valid," he said. Watson's trip also came as American Abby Sunderland, 16, was preparing her solo round-the-world voyage. Sunderland's bid to sail nonstop was undone last week when she stopped for repairs in South Africa. Margaret Bowling, an Australian expedition manager who rowed with a teammate across the Atlantic Ocean about two years ago, said Watson's achievement was incredible, official record or not. Bowling might relate in a way. She said Guinness wouldn't consider her Atlantic row because she received help for repairs, and therefore no record book will show she's the first Australian woman to have rowed an ocean. "Officially in the record books, I might as well not have done it. But in my mind, I spent 73 days in the ocean. ... I have the same amount of satisfaction and pride as [Watson] should," Bowling, who now lives in the United Kingdom, said this week. "You don't cross the ocean and make it out alive and think, 'Wow, I didn't achieve something there.' "
Bowling said if she were Watson, she'd "feel no shame at all in saying that she had sailed round the world, just as I have no shame in calling myself the first Australian woman to row an ocean." But, she said, the sailing community has clear guidelines as to what constitutes around-the-world, so officially no record could be had. Still, she emphasized Watson's solo feat was amazing. "Sailing involves complex machines, so her technical knowledge is phenomenal, for her to have gotten around in one piece." Sarah Outen, a British adventurer who rowed across the Indian Ocean alone in 2009, said the controversy takes nothing away from Watson. "According to the rules of the [group] keeping the record, it doesn't count, but she still sailed around the world. ... The journey is still brilliant," Outen said. She said a generic claim by Watson of being the youngest to have sailed around the world "is not a false statement in that sense." "But then according to the rules, it doesn't match their criteria," Outen said. "It depends how deep you want to go into it. Regardless, it's the journey and not the record that counts, Outen said. "I'm sure she's going to go on to do more," she said. "It's incredible ... she's done something so epic, so young." Should teenagers be allowed to sail solo around the world?